The autobiography and visual record of Canadian painter, William Kurelek (1927-1977) reveals the work of a prolific artist, resolute Canadian documentarian, and visionary narrator. Through the expression of his visual language, and the precision by which he selected his subject matter, Kurelek translated a lasting and dynamic vision of Canada’s peoples, geography, and culture. Kurelek’s artistic legacy also reflects his profound devotion to Christianity and the means by which he utilized visual art as a platform for evangelization. 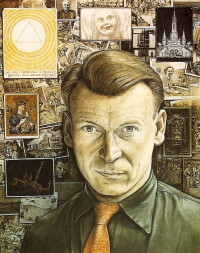 While Kurelek’s visual record is indicative of his kinship and sensitivity to Canada’s peoples and landscapes, he approached his artistic practice as that of a spiritual practice- one which was deeply inspired by: his conversion to Catholicism, literal translations of the Bible, and the legendary didactic masterworks of the Renaissance and Northern Europe. Examination of Kurelek’s own body of moralizing work reveals his relationship with subjects such as: the Gospel According to St. Matthew, the Huronia Mission, the Catechism of the Catholic Church, abortion, the apocalypse, morality, and sin. Unbeknownst to most- who largely applauded and admired Kurelek for his pensively articulated Canadian landscapes, the artist dedicated a sizable body of his work to the discussion of Christian morality and ethics. It is in these works that Kurelek’s emotional, opinionated, and obdurate opinions are revealed, and his relationship to society as that of a Christian missionary, affirmed. It is also important to note that during his short lifetime, Kurelek rendered more than 10,000 images. My research on the subject matter of Kurelek began in 2009, whilst studying classical painting and iconography in Florence, Italy. Between 2009-2010, an extensive effort was undertaken to compile a digital archive of Kurelek’s visual record, writings, and publications. Following a labyrinthine paper trail which took its starting point from Kurelek’s autobiography (Someone With Me), an examination of site specific locations where Kurelek had lived and worked, inclusive of London, San Miguel Allende, the prairies of Alberta and Saskatchewan, and Toronto, ensued. It is critical to note that when Kurelek reached London in 1952, he voluntarily checked into the Maudsley Hospital, initially receiving care as an out-patient, though was later admitted as an in-patient – a time during which he painted many images, including The Maze, under the auspices of Maudsley’s pioneering art therapy treatment program. Kurelek was later transferred to Netherne Psychiatric Hospital where he underwent electro-convulsive therapy. Upon amassing the digital archive, a classification of Kurelek’s work into recognizable thematic sequences followed. The classification of the digital archive also informed and supported the promulgation of my theories on Kurelek’s position as Canadian documentarian and Christian missionary. To date, my research has resulted in the successful development of original course content, which I have presented and taught at the University of Toronto, Royal Ontario Museum, and Art Gallery of Ontario. This entry was posted in William Kurelek - Canadian Painter on July 29, 2010 by mberenyi.